WESTMINSTER has been urged to "respect the will" of the Scottish Parliament and make further changes to key Brexit legislation, after MSPs refused to give their consent to the EU Withdrawal Bill. While the UK government could force the bill through against the wishes of Holyrood, such a move could spark a constitutional crisis. Westminster has never before introduced legislation that covers devolved areas without the approval of the Scottish Parliament. After MSPs voted by 93 to 30 against consent to the Withdrawal Bill, Scottish Brexit Minister Mike Russell demanded: "The UK government must respect the will of the parliament." But the Tories hit out, claiming it was "patently obvious that Nicola Sturgeon wants a political crisis to provide cover for her independence drive". Mr Russell will now write to David Lidington, Theresa May's de facto deputy, who has been leading talks with the devolved administrations for the UK. He wants the Tory minister to come to Scotland and "hear the concerns of all parties" after SNP, Labour, Liberal Democrats and the Greens joined together in the vote. Scottish Labour, which has been pressing for cross-party talks in a bid to end the row, said it was "welcome" both the UK and Scottish governments had agreed to these. Scottish Brexit spokesman Neil Findlay said: "Labour stands ready to work with other parties to find a solution." The long-running dispute between Edinburgh and London centres on what should happen to powers held by Brussels after the UK leaves the EU. 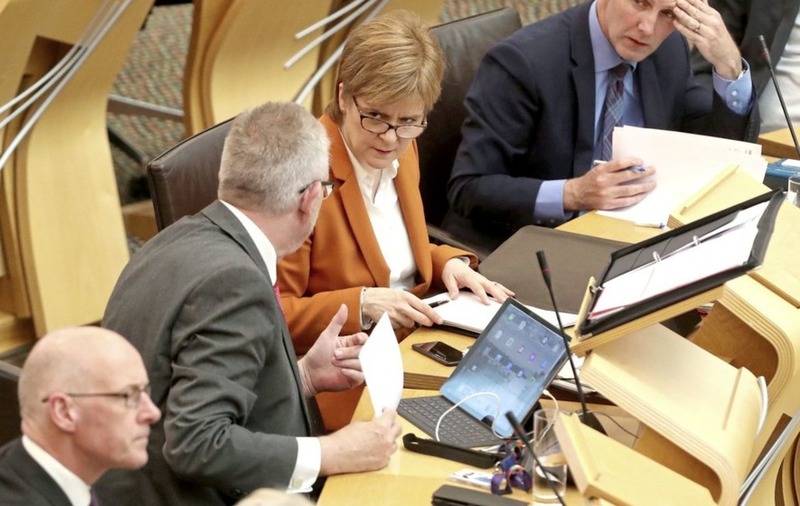 Scottish government ministers fear the bill, as it stands, could constrain Holyrood for up to seven years after Brexit. Mr Russell said: "The UK government wants to take a power to restrict the competence of this parliament. "And it wants to be able to exercise this power even in the face of an explicit decision by this parliament that it should not. "The Scottish Parliament has now said overwhelmingly that this attempt to undermine devolution is unacceptable. "If they now move to force on this parliament an arrangement for restricting devolution that does not have parliament's consent they will do so in the full knowledge that they are breaking the 20-year-old devolution settlement and operating out with the agreed constitution. "The solution, as this parliament has agreed, is straightforward. That is for the UK government to remove the clause that fundamentally undermines devolution and to proceed on the basis of agreement." Scottish Secretary David Mundell made clear the UK government was "disappointed the Scottish Parliament has declined to back the EU (Withdrawal) Bill". The Tory MP said: "We have worked hard over the past year to try to secure the support of the Scottish government, and have put a considerable offer on the table with the vast majority of devolved powers automatically flowing from the EU to Belfast, Cardiff and Edinburgh. "We remain hopeful that the Scottish government will still come on board. Even at this late stage our door remains open." Scottish Conservatives went further, accusing the first minister to seeking to provoke a crisis over Brexit as part of efforts to push for a second independence referendum. MSP Adam Tomkins, the party's constitution spokesman at Holyrood, insisted: "A deal is there to be done on Brexit. It is deeply regrettable that the SNP has refused to take it." He hit out at Labour and the Liberal Democrats for voting with the SNP, and said: "It's patently obvious that Nicola Sturgeon wants a political crisis to provide cover for her independence drive. "The SNP has taken the wrong path today. It's deeply disappointing that the leaders of Labour and the Lib Dems have helped them do it." 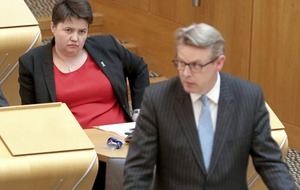 But SNP MSP Ash Denham said: "The Tories think they can do whatever they like to Scotland and get away with it. "The Scottish Parliament has spoken loudly and clearly – it's now up to the UK government to respect that vote and ditch their power grab." First Minister Nicola Sturgeon later tweeted: "UK Gov wants @ScotParl to take it on trust that they won't act without our consent on devolved powers in future – but within minutes of vote they say they will go ahead with #EUWithdrawalBill without our consent. "@ScotParl did the right thing today – let's hope UKG now listens."